Bird Skeleton - What's Unique? Compared with a mammal or reptile skeleton, there are many fewer bones in a bird skeleton. This is because flying animals need a light but rigid skeleton, which is most easily achieved by the fusion of some smaller bones and the elimination of others. Teeth, and the heavy jaws to support them, are gone. Wings and legs have the same basic parts as our own limbs, but highly modified. 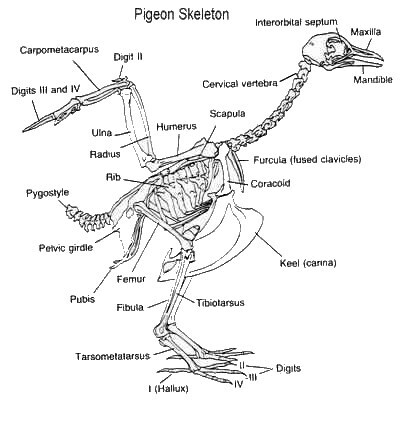 While we have 29 bones in our forelimb, the pigeon has 11. In a bird skeleton, the equivalent of the 1st and 5th fingers are gone, and the 2nd is fused to the third. The phalanges of the 3rd and 4th digits hold the primary feathers. The sternum, or breastbone, is highly modified in birds. Most birds have a keel-shaped sternum, which creates more surface area for the attachment of flight muscles. Bones of the rib cage connect the back with the sternum. 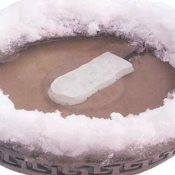 Each rib is connected to the adjoining ribs by a small bone, all together called the uncinate process. 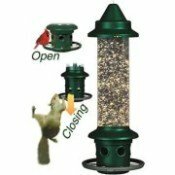 Only birds have this system, which provides additional support. As an adaptation for flight, bird bones are extremely lightweight. Many bones have air spaces, and the longer limb bones are sometimes completely hollow. The hollow bones have an internal support system of struts. 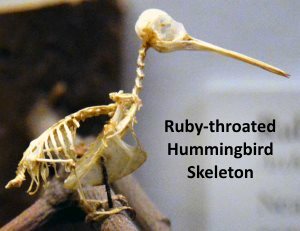 Photo of Ruby-throated Hummingbird skeleton courtesy of Emily Mathews.